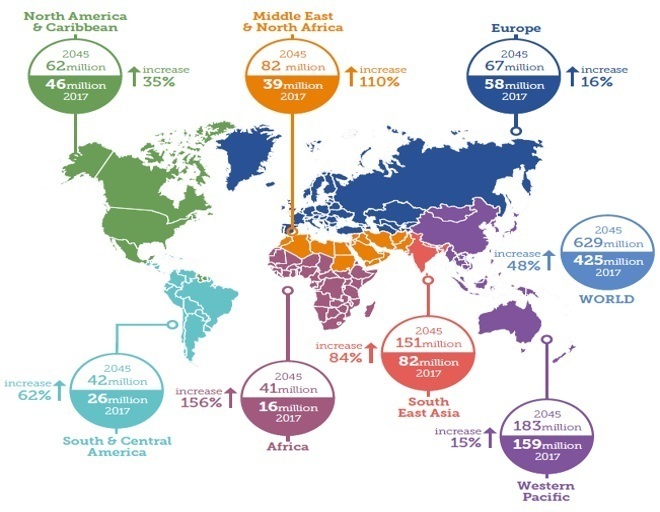 A new report by Colliers International entitled 'Diabesity – Impact on the MENA Region' has revealed that the number of diabetic patients in the Middle East & North Africa (MENA) region is expected to increase by 110 per cent to 82 million by 2045, second only to Africa (156 per cent), significantly impacting mortality, loss of productivity (GDP) and increased healthcare expenditure. The report, which is part of the Arab Health Market Series, also highlighted the economic burden of diabetes in the region which reached US$ 21.3 billion and is expected to jump by 67 per cent to US$ 35.5 billion by 2045. Meanwhile, eight Middle Eastern countries – Kuwait, Qatar, Egypt, KSA, Bahrain, UAE, Jordan and Lebanon – have the highest ratio of obesity among adults globally with 27 to 40 per cent of the total population affected. 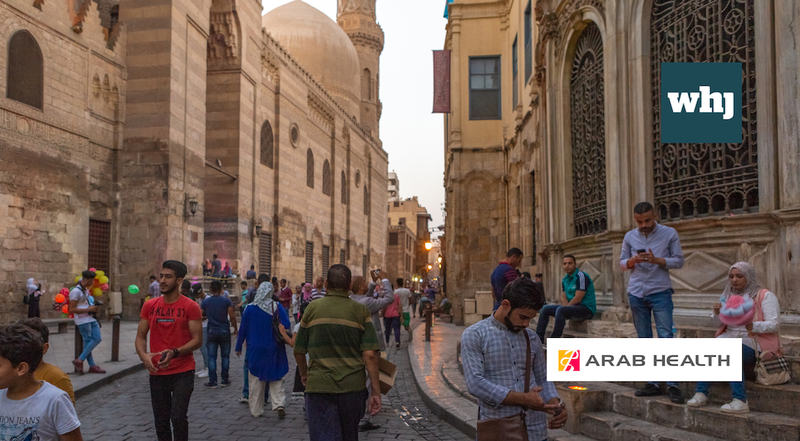 Published ahead of Arab Health 2019, which takes place from 28–31 January at the Dubai World Trade Centre, the latest research from Colliers International provides in-depth analysis of the key factors impacting the diabesity epidemic - which refers to a twin occurrence of the epidemics of Type 2 diabetes and obesity - with a focus on the MENA region and its future outlook. Ross Williams, Exhibition Director of Arab Health, said: "With health professionals and researchers considering diabesity as potentially the greatest epidemic in human history, the advancement of communication technology, telehealth and application of Artificial Intelligence (AI) is now playing a critical role in management of chronic illnesses such as diabesity and obesity. The economic and societal impact of the epidemic is a catalyst for the entire healthcare industry to come together to offer collective solutions to this global problem." According to the report, factors contributing to the diabesity epidemic in the Gulf region include; altered eating patterns due to increased income and urbanisation (only 38 per cent of the GCC population eats fresh fruit and vegetables), sedentary lifestyles (60 per cent of men and 73 per cent of women are physically inactive), barriers to a healthy diet and lesser emphasis on nutritional education, as well as increased consumption of sugar and sugar substitutes (GCC countries represent a US$ 8.4 billion soft drink market). The report also outlined a number of preventative measures being taken by governments around the region to tackle the growing problem of diabesity. For example, the UAE has developed a clear roadmap for combating and controlling diabesity. Though the challenges are still being faced in some areas such as lifestyle modification, physical inactivity and diet, government measures have led to a drop in the prevalence of diabetes in the UAE from 19.3 per cent in 2013 to 17.3 per cent in 2017. Some of the current measures being carried out by the UAE government include the Abu Dhabi Children’s Obesity Task Force which plans to reduce obesity by increasing physical activity in children by 15 per cent and reduce the average body mass index by 15 per cent by 2020, as well as the introduction of a 50 per cent “sugar tax” on soda and 100 per cent on energy drinks and tobacco products, in order to lower obesity and diabetes rates. Arab Health, the largest exhibition and congress for healthcare and trade professionals in the MENA region, will host the 5th Diabetes Conference bringing together the region’s foremost experts to measure the prevalence of diabesity in the region and to discuss the latest developments in its prevention, treatment and management. "The Diabetes Conference at Arab Health is the perfect platform to bring together all stakeholders - from government authorities to the region’s leading diabetes experts - to assess the various public health measures and technological advances that can be adopted in order to tackle the growing burden of this epidemic,"
To download the 'Diabesity – Impact on the MENA Region' report, click here. Arab Health 2019 took place on 28 – 31 January 2019, at the Dubai World Trade Centre, Dubai, United Arab Emirates.